Just to share a "new" variant of rummy nose tetra that seems to be appearing at various LFS recently, i bought a few batches of them from different LFS over the past few weeks to gradually stock up my tanks. The photo above doesn't really show the full extent of their colors... but as you can see, their bodies have a much more intense silverish/blue shine to the scales. At some of the LFS that i bought them from, there were "normal" rummy nose tetras for sale in nearby tanks and i could see the big difference in their body colors. The normal rummy nose tetras have their usual whitish/silver body color, but way less shiny than the platinum ones. The difference could be seen even from just a few meters away. They were labeled as "Platinum rummy nose tetra" or "Rummy nose sp platinum", and cost double that of normal rummy nose tetras. I've been searching the internet trying to find more information on this particular variant and it seems no one has posted anything about them yet. This is the first time i've seen these particular fishes appear at any LFS. 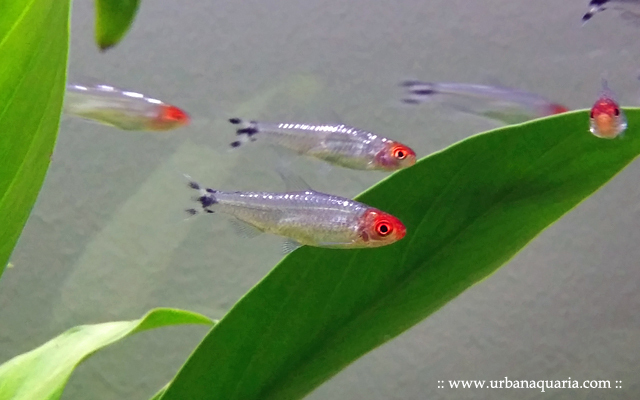 One of the reasons why i was never too keen on rummy nose tetras is because while they have bright red noses and excellent schooling ability, the rest of their body tends to look abit bland and dull... but these platinum variants look absolutely amazing. I do hope this variant is a regular import as they are quickly becoming my most favorite fishes... bright red nose + shiny platinum body + perfect schooling ability = best combination! Which lfs did you buy ? I bought mine from OTF Aquarium Farm... so far, i've seen a few other LFS selling them too, like Aquatic Avenue, Fishy Business, East Ocean etc. That not the best or the exotic, check out the rummy nose rasbora! Only thing is that only the males have the nice coloration (females are dull colored in comparison), and they only shoal occasionally in scattered groups. They don't school as tightly and constantly like the real rummy nose tetras.